Casks – how much does an empty barrel cost? In the Scotch industry, an investment in maturing whisky often requires the purchase of two distinct assets: the liquid itself; and the wooden cask which contains it. The price of wood is not linked to the cost of distilling Scotch whisky, and only partially linked to the demand in Scotland for barrels. Other important factors include the level of alcohol production in cask-making nations and worldwide demand for such barrels, among others. Most Scotch is matured in American oak barrels which have previously held Bourbon. As a result, the price of these casks is linked to the amount of whisky distilled in the United States, the wider fortunes of the American lumber industry and worldwide demand for these barrels, among others. Separate dynamics also exist for casks which have held other alcoholic beverages. To complicate matters further, the majority of casks used in Scotland are 'refills'. A refill cask is one which has held Scotch previously, along with any other beverage that the barrel may have originally contained. For this reason, the level of Scotch whisky production over recent years also directly affects the current price of most casks. Over the last decade, there has been an upwards trend in the price of an empty cask. In the period 2012-2015, cask prices rose significantly across the board, thanks to surging demand in both the Bourbon and Scotch industries which the American lumber industry, still recovering from the 2007 housing crash, could not satisfy. 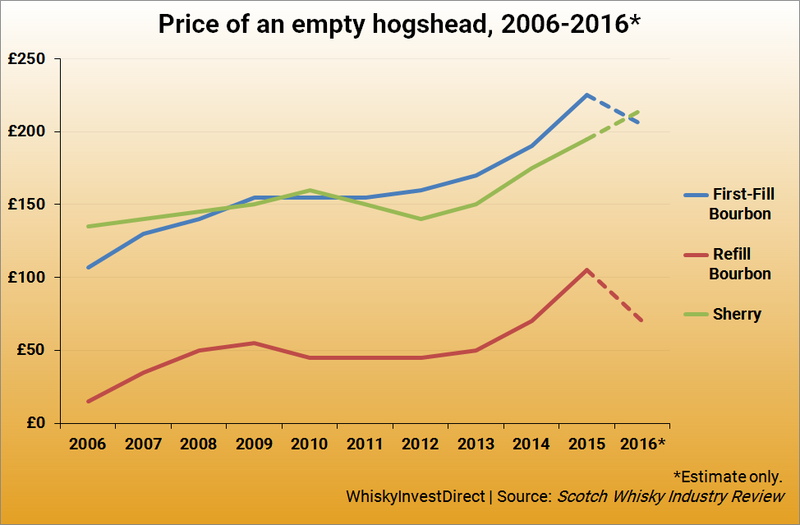 Estimates for 2016 suggest that prices may have begun to decline, although the cost of ex-sherry casks still remains firm. To simplify matters, only the maturing whisky itself is sold on our platform – but not the cask which it is held in. At the same time, the cask which a whisky is matured in does have an impact on the spirit's value. This difference may be reflected in its price. First fill casks (i.e. casks which have never held Scotch before, only other alcoholic beverages such as Bourbon or Sherry) normally have more influence on a whisky than refill casks, which have previously held Scotch one or more times. For this reason, Scotch matured in first fill casks are often more flavourful at a younger age. Thus, the industry typically attributes a premium to these types of cask. Nevertheless, while first fill casks normally impart more flavour than refills, this does not necessarily translate into better results in maturation. While first fill casks can be exceptional, the impact of the wood can sometimes overpower the spirit itself. As a result, most single malt and blended Scotch whiskies are made from a combination of whiskies matured in both first fill and refill casks, with the majority consisting primarily of the latter.